You can help. Please visit our volunteer page to become involved! Each year, dedicated Pacific Crest Trail Association volunteers and staff flock to the woods with picks, shovels, saws and spirit to rebuild washed-out bridges, cut away fallen trees, and restore eroded portions of the trail. We recruit young and old by the hundreds to give time and energy to fix what needs to be fixed from Mexico to Canada. PCTA volunteers and corps crews devote tens of thousands of hours to keeping the trail open. As a result, hikers and equestrians alike will tell you that the PCT is one of the finest trail experiences in existence. In 2014, 1,591 citizen stewards and corps crew members performed the hard, physical labor of annual maintenance and restoration of the PCT, giving others the opportunity to enjoy the beauty of the wilderness while traveling on a safe, passable trail. Their work included cutting back overgrown vegetation, building trailhead kiosks, constructing retaining rock walls and reconstructing trail tread. Volunteers allow our organization to thrive in a way that would not be possible without them. In 2014, the PCT volunteer community, including non-trail maintenance activities, contributed an in-kind value of $1,854,009. The PCT is subject to heavy use, floods, fires, and overgrown vegetation that cause erosion, trail blockage, and other problems. The annual maintenance and restoration of the PCT to meet national quality standards is a major undertaking of the PCTA. The goal is to create a world class wilderness recreation experience that allows people to connect with the great outdoors. The PCTA’s projects improve the trail user’s recreation experience while at the same time lessening the trail’s impact on the environment. For example, drainage control projects keep the trail in place while minimizing sedimentation of nearby streams. Improving stream crossings by relocating the trail or building a bridge makes for a better user experience while protecting riparian areas from erosion. PCTA’s trail work opportunities allow volunteers to deeply connect to the trail, the land, and one another in a unique and lasting way. Volunteers dedicate valuable time and energy to this 2,650-mile trail, both on the ground and in the office. They cut encroaching vegetation with hand saws, remove fallen trees with crosscuts, blast fallen rocks to clear a path and construct new bridges. By maintaining the PCT, volunteers are helping to provide a 2,650-mile borderless pathway so that countless hikers, equestrians, and the volunteers themselves can share in these experiences every year. Our Trail Operations staff is responsible for identifying projects, coordinating trail crews and making sure those crews have the necessary tools, food and support. This team of eight permanent trail operations professionals and a few seasonal members work with more than 1,500 volunteers to maintain, reconstruct and manage the PCT. These staff members make sure that our volunteer program runs smoothly and offers an excellent experience to volunteers. Supporting this extensive trail maintenance program is an immense amount of work. We work with federal and state land managers to secure project authorization. We train and educate our crew leaders and volunteers on proper trail-building and crew-management techniques so project goals are met without injury. We sign up new volunteers and recognize and celebrate the work of existing volunteers. We buy, manage, and distribute many caches of tools. We fundraise to feed an army of hungry volunteers. To help volunteers build their skills and be successful in their trail work, PCTA provides education, training, and oversight in safe trail construction and restoration. The signature training program of the PCTA is the Trail Skills College. The Trail Skills College curriculum was developed in 2009 with a grant from REI in collaboration with non-profit and agency partners. REI and our agency partners continue to support this critical, on-going program. Using modular courses taught at events held along the trail, volunteers, PCTA staff, nonprofit partners, and agency staff serve as instructors to new and returning volunteers eager to increase their trail maintenance knowledge and skills. The courses offered at the Trail Skills College cover almost every aspect of trail maintenance. Beginners develop “trail eyes” as they learn about basic hydrology, brushing, and berm removal. Intermediate and advanced participants can learn how to construct water bars and retaining walls; how to lead trail maintenance crews safely and effectively; and how to earn chainsaw and crosscut saw certification, among other things. 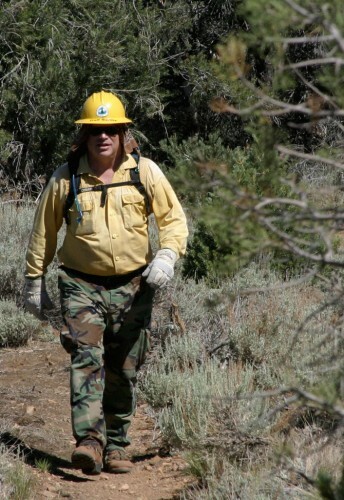 PCTA continues to expand and update courses in its popular Trail Skills College curriculum. These courses are available for free download online and have received critical acclaim from trail organizations worldwide. Beyond the classroom, each and every one of our projects is a training trip. Trail maintenance is a lifelong learning opportunity. By training volunteers with the valuable skills needed to help protect and maintain recreation trails, they become the stewards and leaders, in turn giving countless hours to maintain the PCT and other trails across America’s public lands. Interested in learning more about our activities? We regularly publish trail maintenance and reconstruction updates in our member magazine, the PCT Communicator. Join us in supporting the trail.